The responsibilities within natural hazards involve citizens and volunteers as first actors of civil protection. The prevention implicates technical volunteers, but the priority implies now awareness of local citizens. The involvement of population creates context-specific strategies of territorial surveillance and management. 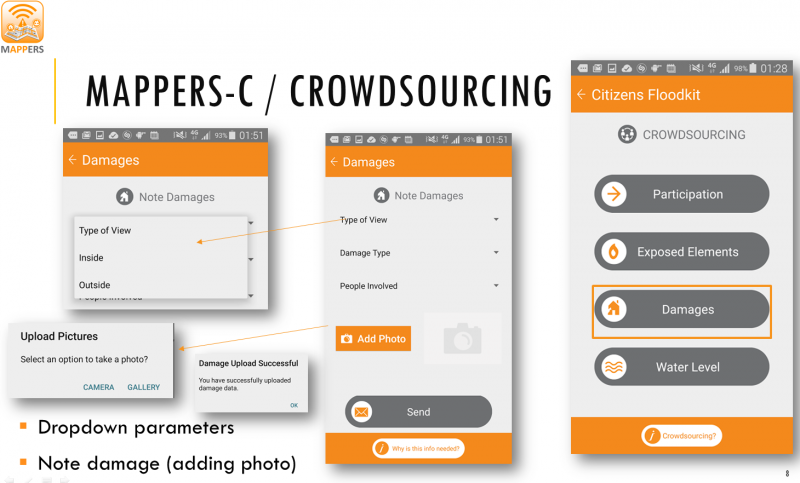 MAppERS empowers “crowd-sourced mappers” through smart phone applications and sensors, with geo-tagged information, detailed gathered parameters, field-check survey in a contest of geospatial response. Enhancing active participation and responsibilisation of the population in territorial management and risk mitigation. Communication and coordination issues within the consortium and with the End-users Advisory Board (EAB) involved in the activities are initially set. Desk-based investigation on consequences of disaster impacts and prevention strategies in pilot countries. Research on involvement of volunteers/citizens in data collection/monitoring and communication methods/graphic solutions in pilot countries. 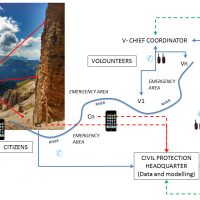 Development of smartphone applications to collect on-site information for different phases of crisis management. 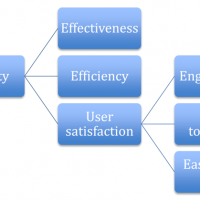 A clear definition of communication rules and criteria, ontology and jargon for an easy-to-use and useful interface. Identification of interested pilot groups of citizens and civil protections to be involved in the in a long run prevention goal. Creation of training strategies for interested in disaster prevention, as actors of territory monitoring. The research involves the analysis of disaster impacts and costs of prevention based on literature review and existing projects. Secondly a state-of-the-art of DBMS in pilot countries is provided with human sensors for data collection/monitoring, linked to communication methods and graphic schemes. 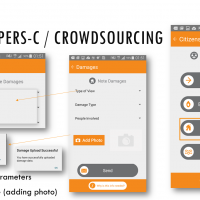 Consequently a review starts on mobile technologies available for disaster management in pilot countries and smartphone applications linked to centralized web server/database. 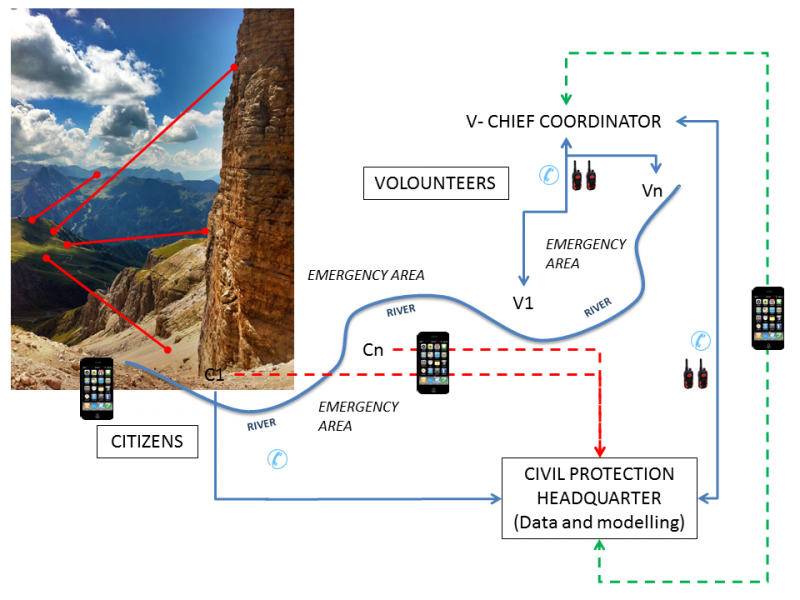 The existing data loggers (instrumental numerical dataset) and crisis information (generic multi-media dataset) in pilot areas are linked. 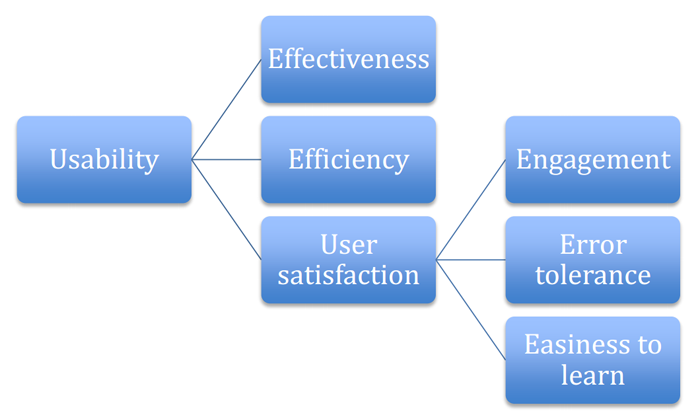 The communication scheme on application interface offer a scheme for software engineering and development with test, feedback and update. Identification of relevant areas for piloting delivers solutions for focus group/semi-structured interviews with volunteers and citizen. The pilot testing and optimization are split of MAppERS-C and MAppERS-V prototypes. A final comparative analysis of pilot outcomes offers an overview within partners. The training includes identification of objectives, trainers and coaches, producing a training curricula and setting up a Self Evaluation Module. A preliminary research provides as deliverables: a SWOT analysis and a database concerning prevention strategies/costs followed by a DBMS solutions adopted. The mobile technologies adopted in pilot countries and at global level are reviewed. 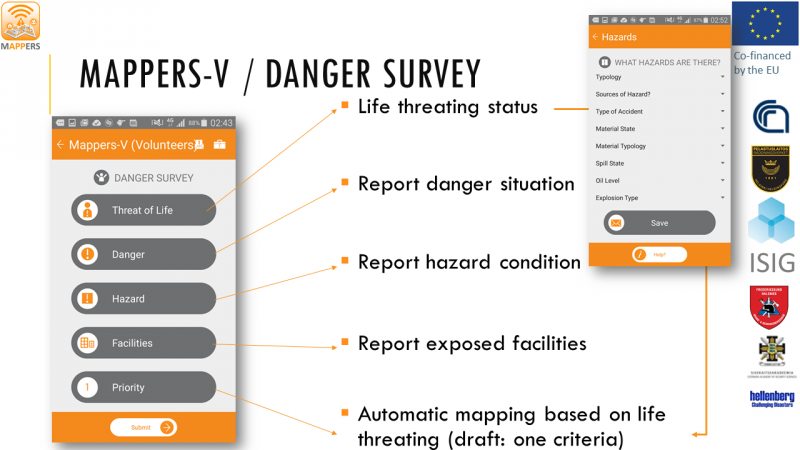 The application and data loggers review are set with a communication scheme. 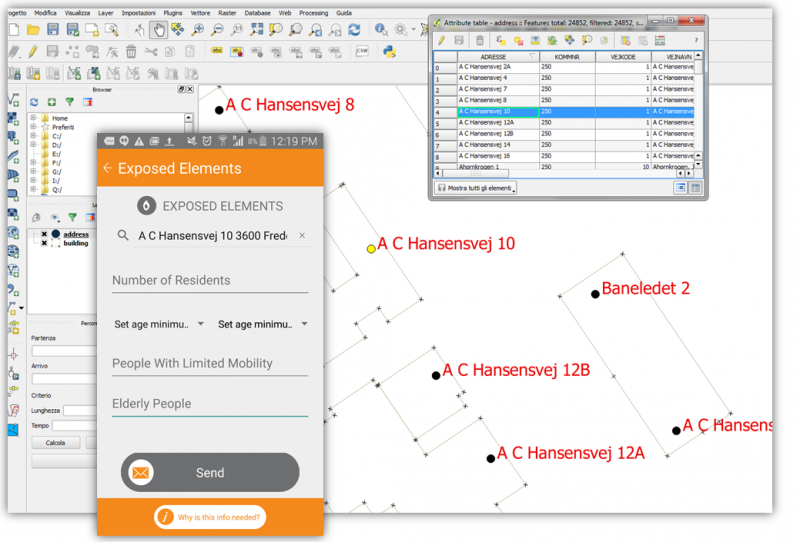 Identification of pilot areas, with informed pilot groups supply the database application and GUI (Graphic User Interface) criteria testing. The application is consequently developed and upgrade continuously and it offers a comparative analysis of pilot outcomes. The training phase provides training curricula, objectives of training identification of trainers, Self Evaluation Module and policy recommendation. All products per single tasks and proceeding status are available in the partners area (project calendar, events, GANTT, e-flyers, media & promo). 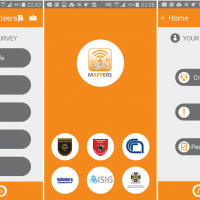 MAppERS is a free smartphone application developed and compatible with Android 4.0 or over. The package includes an .apk file for software installation and a document for privacy/copyright. Every user has to create a profile and register it. 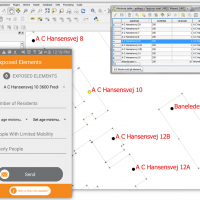 Enabling a profile is responsibility of the MAppERS Consortium. 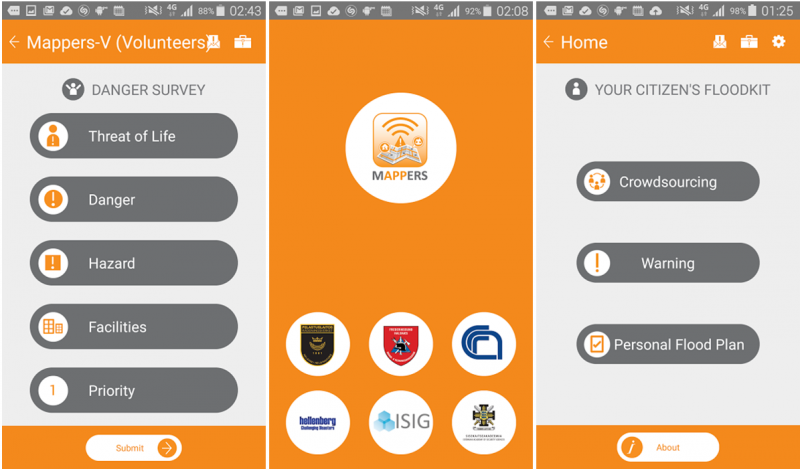 MAppERS focuses on the information sharing system in terms of territorial knowledge, risk prevention and emergency. 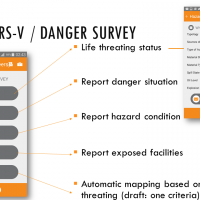 Moreover, it deals with human role as ‘territorial mappers’ through the development of a smart phone application that allows sharing of GPS-localised, precise information on risk situations from the population and trained operators to civil protection.